Las Vegas police have arrested a man who in a YouTube video threatened to kill gays. 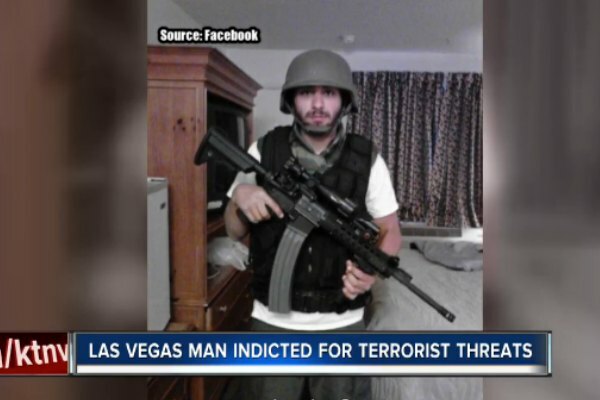 Local ABC affiliate KTNV reported that 24-year-old Bryce Cuellar is being held on $100,000 bail and is scheduled to be in court on Thursday, September 1. In the video, which has since been removed, Cuellar is seen wearing a military vest and holding a rifle. Calling himself a Christian warrior, Cuellar reportedly threatened to kill “gays, faggots, lesbians and satanists.” He said that he was angry over the government's attempts to take away his First and Second Amendment rights. He added that he was tired of America. Police said that Cuellar posted on his Facebook page about the June 12th mass shooting in an Orlando gay nightclub, which took the lives of 49 people and injured dozens more. Police added that Cuellar physically attacked his wife, punching and choking her, about an hour after he posted his video on YouTube. He reportedly threatened to kill her. Cuellar admitted to making the video, telling police that he was angry and drunk at the time but is not a murderer. Police have charged Cuellar with making terrorist threats.